The photo was shot at Books in Browsers. Mary Lou Jepsen, the founder of Pixel Qi, had this tablet in her gadget bag on loan from Pixel Qi's new partner. I was told I had to wait until today to show you the new gadget because that's when it was going to be announced. While I still haven't found any announcement, I can see that the product page is already up. This is the Yuma 2. It is the latest mobile device from Trimble, a construction equipment manufacturer. It's running a full version of Windows 7 on a dual core 1.6GHz Atom Cedar Trail CPU with 4GB RAM and 64GB Flash storage, camera, Wifi/BT, and a case which is designed to survive your average construction site. The screen you see is a 7" Pixel Qi screen, and in keeping with the rugged design of the tablet there is also a sheet of Gorilla Glass on top of the screen. This is the first time Trimble used a Pixel Qi screen on their rugged tablets; I believe the the original Yuma used a different screen, though it's not clear from the product page exactly what that was. 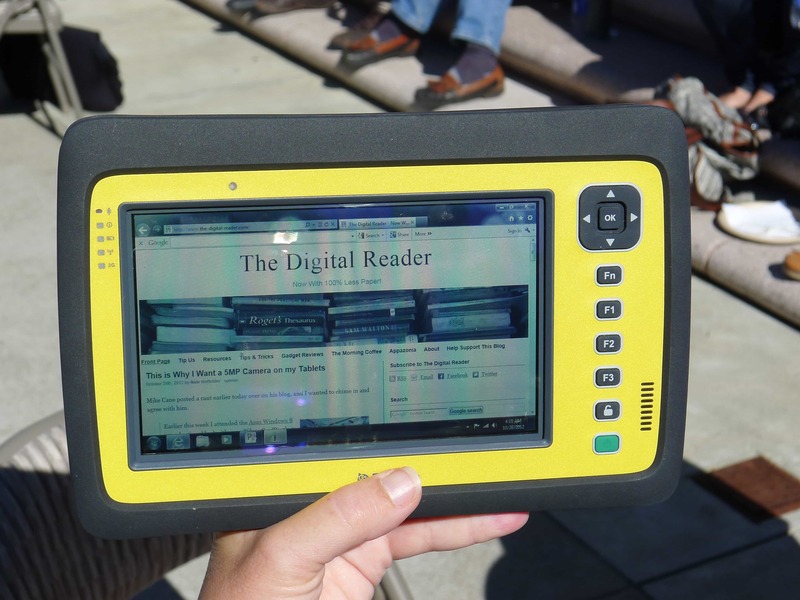 As my regular readers know, what sets Pixel Qi screens apart from LCD screens is that it is sunlight readable as well as low power. The screen on the Yuma 2 is the latest work from Pixel Qi, and as you can see in the photo, it keeps a fair amount of the colors while being used outside. That is a marked improvement over past screens, which tended to wash out and fade to grayscale when viewed in sunlight (I have a couple). Retail price on this tablet start at just under $3k and go up from there. Check with Trimble or your local sales rep for more details. Thanks! That was not showing up for me this morning. Curiosuly enough, it doesn’t say that the screen tech is Pixel Qi. That was not live when I posted. All I could see was a 401 error message.